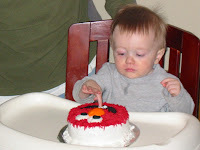 We celebrated Cole's 1st birthday this weekend. Cousin Jackson came from Kansas City along with his mom and dad. On Sat. 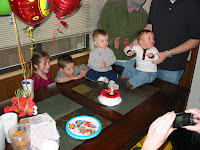 night, Lillian was the only girl in a house of 5 boys ranging in age from 10 wks to 4 years. 4 of those 5 were under the age of 2! I think I finally found all the toys that were strung about the house in a twisted toddler game of hide and seek. Good times!